Cut the lining piece ( if you are going to line it) allowing an extra 0.5-0.8cm seam allowance around the outside edge. 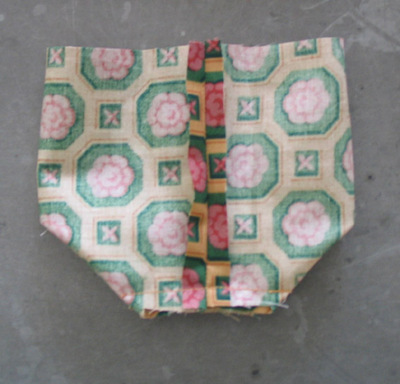 I have just folded the pattern piece I used for the outer felt shell to make it easier to cut. 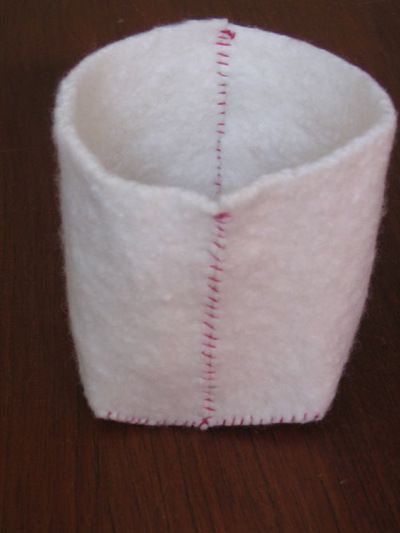 Stitch as for the felt box either by hand or machine. This is what it looks like when you have flattened the 'box" to sew the bottom seam. 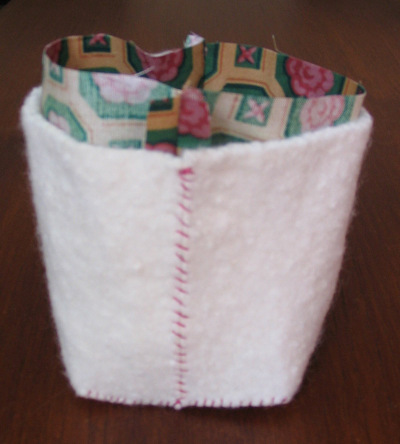 Put the lining inside the felt box with right sides together and side seams matching. Turn the edge of the lining over to the same height as the felt box to neaten raw edges and use a running stitch ( or your choice) through both layers to secure. There you go ..a simple yet pleasing box to put things in. And take things out of. Just like Eeyore and his useful jar that Pooh gave him for his birthday. Not suggested for hunny though! Let me know if this is a dreadfully unclear pattern and I will make any necessary changes. 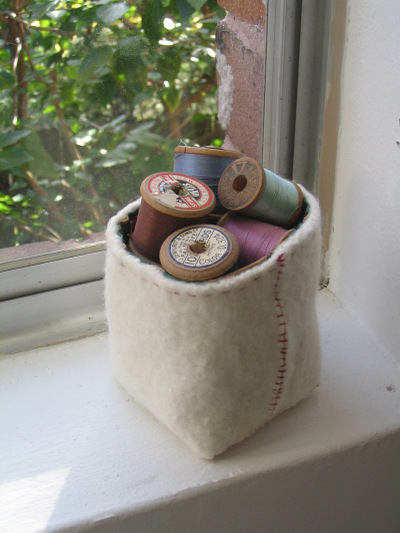 Love the felt box, it would be great to give gifts in or store things around the house. I may just have to make some of these thanks for the instructions. Also, loving the little bird pendant just gorgeous!! nice idea! i've been browsing your blog -- lovely work! i did some similar birds as a gift recently; the stitch patterns you used have so much personality. That felt box is so cute that I just had to make one today as soon as I saw it. I'll take a picture but it may be a week before I can post it because I have to take pictures the old-fashioned way, wait for them to develop and scan them in. Thanks for the pattern/tutorial! I think I'll be making more of these! This box is beautiful! And your felt really looks gorgeous, looks amazingly soft. Is it pure wool? this is so stunning! thank you for sharing it. felting is one of my favorite things. thanks for the tutorial.. i'll be making one of these for sure..
thanks for the tutorial! What a sweet little box, and useful, too! Now, off to find some decent felt! Thaaaank you for such a nice and simple tutorial, I am just cutting the first box, I promise a pic when it is finished !! I don't get it. I did the felt (cut it out) and after that its like what the.... can you explain it better by emailing me??? As soon as I saw this tutorial I went immediately to the thrift store for some sweaters to felt in the wash. I made about a dozen of these for my co-workers' desks for pencils, scissors and such. They thought I was wacky for making boxes out of sweaters but they loved them nonetheless. My next goal is to make bigger, more shallow ones to organize my magazines. Thanks for the tute. What cute and useful little box. Love it! I am going to have to make a few of these. I am thinking pre-quilted fabric. Great tutorial must try it! Thanks for this, will add it to my growing list of must-try-projects! 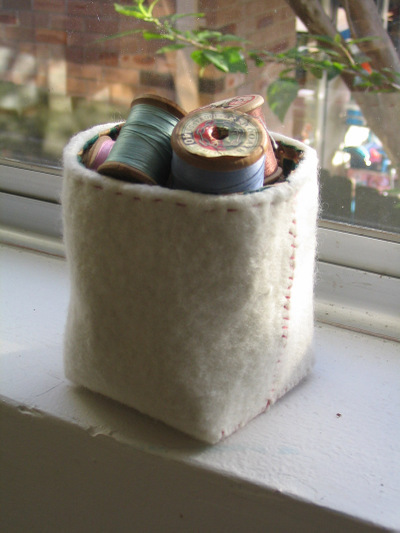 Once again, I was inspired by this post to try a little felt box. For months I held this picture in the back of my head. Last week someone gave me my first Japanese felt book! They are the best! My pattern is a little different and I sewed it with the machine. Both patterns are sweet, but your picture is cuter. Great tute! I have put up a link from my blog http://crafttutorials.wordpress.com I hope that's ok! So cute and perfect! Thanks. Hi! Your little tutorial has been lurking in my brain for a week now, and I finally got the guts to give it a go this morning, on a slightly larger scale! I'm happy to report that it worked, and I even managed to make my first tutorial from it! Thanks for the inspiration! Thanks for the tutorial! I've made a couple of these baskets already, and just love them. For pictures go to my blog: http://pm-betweenthelines.blogspot.com/2009/01/piece-of-white-paper.html. One is still in the making: http://pm-betweenthelines.blogspot.com/2009/01/felt-like.html. Hi love the box, i just noticed that i have the exact same red thread as you and alot of the threads from the same brand. I love how you explained it so well and I can make these in any size!! I'm going to make a basket as part of a teacher thank you gift thanks so much!! I made the box in deep green. So cute and useful!